closer to being released. 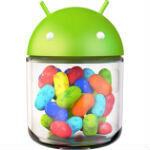 The general consensus is that Android 4.2.2 will be the last bug fix update for Jelly Bean before Google announces and (maybe) releases Android Key Lime Pie (theoretically 5.0, or 4.3) at Google I/O in May. The story goes that Google has been having employees test the 4.2.2 update on all of the Nexus devices - Galaxy, 4, 7, and 10 - and that the update is close to being released. There isn't a lot to the update, which is expected to be very minimal. The only major issue that is expected to be fixed is the "stuttering" audio issue when using a Bluetooth headset with the Nexus 7. 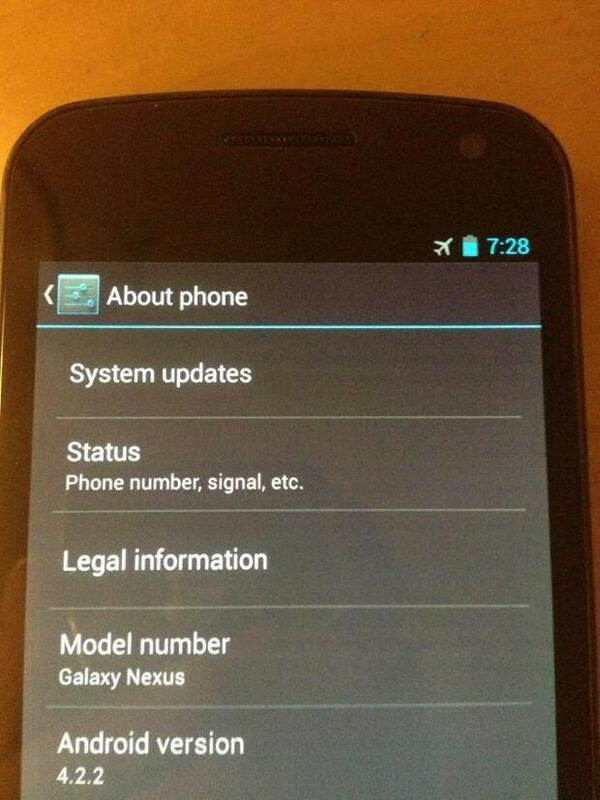 The image that has surfaced is of the Galaxy Nexus running Android 4.2.2 (or at least running a ROM that identifies itself as Android 4.2.2). This just adds to the leaks that we've already seen including some video, and reports that Nexus 4s were coming with 4.2.2 out of the box in Brazil. Word has it that 4.2.2 will be released in "mid-February", which would mean it's on its way in the next couple weeks. Nobody cares about carrier-crap devices. The standard international version is much better. "The standard international version is much better." Agree. Its sad that Google always working on a new is rather than accumulate all the information that most 50 percent of android smart phones a still running gingerbread. Should all const rate on coming up with ideas to make it easer for older phones to at list get the latest os so there isn't a need to install roms or buy a recent phone every 6 month. since processors these days can handle alot of load (RAMs and GPUs also), i guess we will see higher adaption rate for latest updates even on "low" to mid end devices...because those 50% that are still on gingerbread has low hardware compared to hardware these days, and i guess the hardware game will slow down now that we reached processors that can handle microsoft's windows. there is an idea, it's called rooting. there's another one, don't buy from whatever OEM screwing you over with updates. if updates mean the world to you then may be you should start considering a Nexus. other than that, i can't see how Google could force OEMs to update their legacy devices, could you? um, get it. there's an official 4.1 leak and perfect 4.1 and 4.2 ROM's out there for the Razr. But us non-geeky people don't know where to find that, or how to do it. I am not rooted. Side note: Does the Galaxy Nexus work on T-Mobile 4G? Yes, but only if you have the GSM version that was on sale in the Play Store. The Sprint or Verizon versions will not. So he gets thumbed down for giving the appropriate answer to a question? I swear people are so immature. Doesn't surprise me one bit. I think I'm used to it by now. A lot of crazies on this site. Thanks and I do have the GSM version. If I root my nexus 10 will I get the update while still rooted? hahaha This is sarcasm right? So you rather get a phone that gets very few updates, and when it does it makes your phone even less usable. Did you see the people complaining about the Iphone 5 with it's "updated" software? Don't remember anything about Google Maps being deleted, blah, blah, blah? I have to agree. I think my battery life has worsened too. Trust in Google. They here our concerns and are cooking up a batch of android dessert for our pleasures!